Max Allen is now working on the molas made by the Kuna women of the San Blas Islands of Panama. 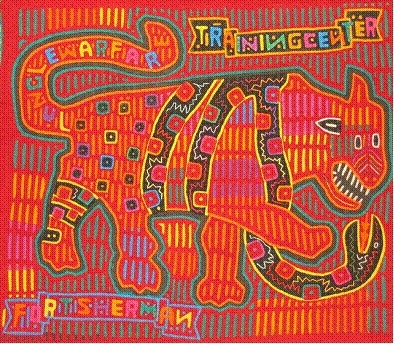 The motif of the feline (leopard?) and the serpent (and its origins in the chireh “hunting cloths” of Herat was first noticed by George W. O’Bannon in Hali #129, 1982, and more recently by Nick Fielding in Asian Textiles #40 June 2008. It also appears in several Ali Khojeh style carpets we’ve seen… Perhaps the clue to the mola is to be found in its text: Fort Sherman, Jungle Warfare Training Center? Did someone bring a carpet with them from Afghanistan to Fort Sherman? This entry was posted on October 28, 2008 at 11:17 pm and is filed under Uncategorized. You can follow any responses to this entry through the RSS 2.0 feed. You can leave a response, or trackback from your own site. Our pussycat with the wrapped snake evidently travelled in the opposite direction: the mola was made first, around 1960. Actually that is not an Ali Khojeh (Khodja) style. I have many and they are defined by the border which is quite refined and distinctive. There are many field designs however indigo is the primary colour. Ali Khodja’s are quite rare however if you visit Afghan carpet shops in the UAE and Kuwait you will find them rather easily. If you are adventurous then you will find them in Kabul on Chicken Street for around $10-20 per square foot. Ali Khodjas are also ALL finely woven often on silk foundations but if not then on single strand spindle wool foundations. A common theme is the pomegranate tree of life style. 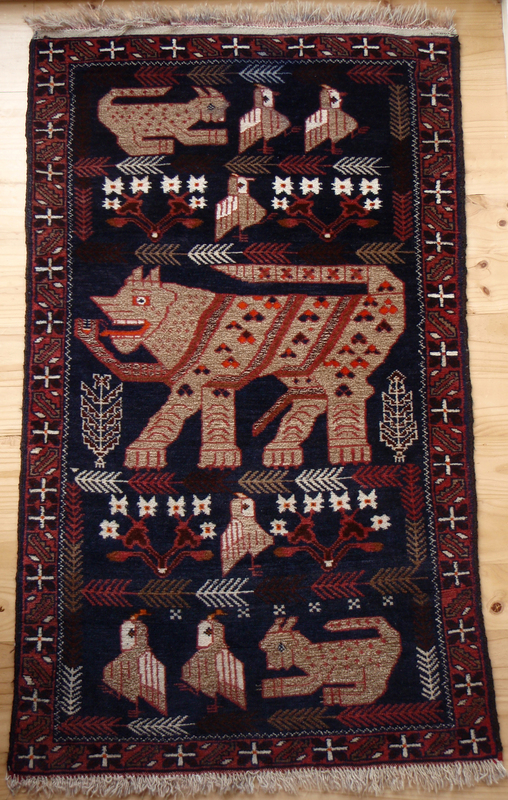 There are 2 examples of this style in “Oriental Rugs Vol 3 The Carpets of Afghanistan”. They are not attributed to Ali Khodja. If you were to visit Ali and Husseins carpet shop in Kuwait city then you will find two very knowledgeable and reputable Afghan dealers who can educate you further regarding Ali Khodja carpets. Thanks for the comment. I did not mean to suggest this is Ali Khojeh – however the image of the snake wrestling the leopard is something I have seen in several of the real AK’s. Can you email me a contact for your friends in Kuwait?